The three operas which Janáček wrote in close succession – Katya Kabanova, The Cunning Little Vixen and The Makropoulos Case – all end with the death of the heroine, but “Vixen” closes with the idea of the renewal of life in youthful nature, and it seems a particularly apt work for performance by students. However, and this will come as no surprise to those who frequent the Britten theatre, both the vocal performance and the quality of orchestral playing were of a level far above that of the merely apprentice. “My very own Vixen Bystrouška, where did you take your lament from, when the old forester tied you up to a kennel? You, motif of the sharp teeth, where have you seen yourself before?” – Janáček wrote in 1928, and it is that lament which is the most deeply lyrical and poetic part of “Vixen”, with an intensity comparable to Katya’s description of going to church alone, and Jenufa’s forgiveness of Laca – in this performance Sadhbh Dennedy gave it all the passion of youth, and Michael Rosewell obtained playing of finely judged fervour from the orchestra. 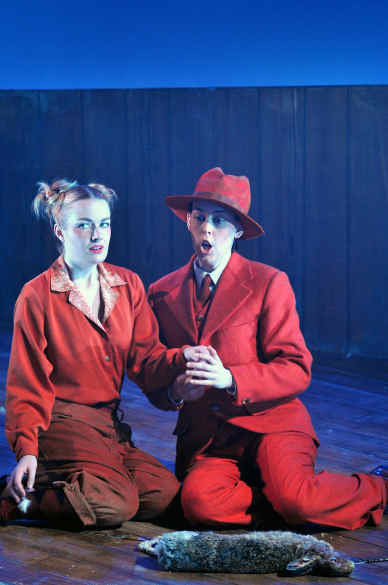 That passion in performance was characteristic of the evening as a whole, and it introduced two singers, Dennedy and James Oldfield’s Forester, who I am sure will go the same way as such previous Britten Opera School alumni as Elizabeth Watts and Andrew Kennedy – that is, right to the top. The production was a simple one, with little to suggest the forest or the interiors beyond exceptionally beautiful lighting (Mark Doubleday) and an appropriate cage used for both the Vixen and the “bar”. The inn scenes resembled Dutch interiors in their sense of intimacy, some of them looking as if straight from a canvas by Gerrit Dou. The production’s motif was very much the Blue Dragonfly, elegantly danced by Naree Kim, although there were occasions when I felt her presence a little intrusive. The role of the Vixen is never easy, in that the singer needs to avoid excessive winsomeness – in some ways, it presents a mixture of challenges akin to singing Jenufa and Zerbinetta in the same opera – and Dennedy rose to most of them, her bright, ringing soprano scaled down when required yet given full rein at heightened moments. Both her singing and her unaffected acting recalled Helen Field’s classic assumption of the role. James Oldfield is already an experienced singer – he is a member of Polyphony and has a flourishing concert career, and his assurance and stage presence are exceptional, reminding one of Thomas Allen. The voice is not far behind, being a rich, warm baritone used with taste and finesse – this was a remarkable Forester, commanding the stage with the kind of ease and fluency you expect to see in a much larger house. There were no substantial weaknesses in the cast, with characterful assumptions from Angelica Voje’s Fox, Alistair Digges’ Schoolmaster, Jimmy Holiday’s Priest and Badger, and Madeleine’s Pierard's trio of Cricket, Frantik, and the Rooster. Special mention should be made of Sarah-Jane Brandon’s Chief Hen and Innkeeper’s Wife – this vibrant soprano won the 2008 Maggie Teyte Prize, which will surprise no one who attended this performance; another future worth watching. Student orchestras often play with remarkable finesse for great conductors, and Michael Rosewell’s partnership with the RCM group is an exceptional one – a few small intonation glitches aside, the strings and woodwind especially gave chamber-music quality to this seemingly simple yet often opaque score, and they supported the singers with sympathy. Even the children (from the Betty Wivell Academy) were adorable rather than over-cute, and I only winced at them once or twice. What more could you ask for? Just one more performance, on July 2nd, with a few cast changes – catch it if you can.